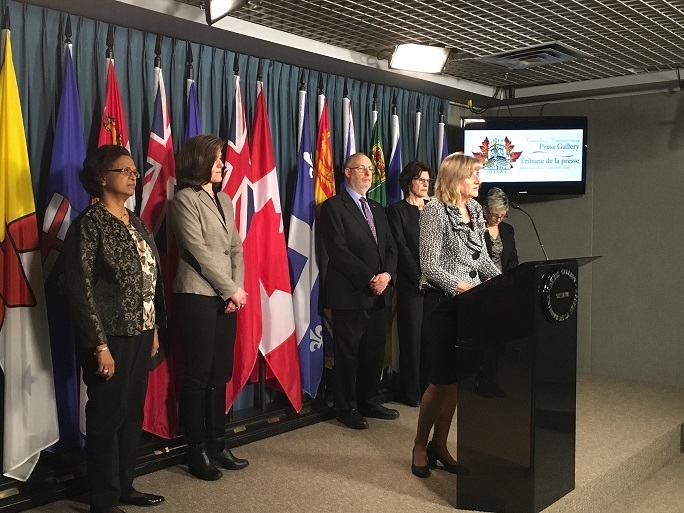 Ondina Love, CEO, CDHA, speaks at a press conference on Parliament Hill on December 21, 2016, to urge government not to add a tax on health and dental benefit premiums. Media reports indicated that the federal government was contemplating the taxation of private health and dental insurance plans. If this proposal were to become a reality, the health and dental coverage currently available to 24 million Canadians would have been severely limited as fewer employers would have offered these plans and others may have reduced the number of services covered. These plans provide essential health and dental services not covered by the publicly funded health care system, including dental hygiene care, prescription drugs, vision care, mental health services, and musculoskeletal care. If the federal government were to tax private health and dental insurance plans across Canada, this decision would have enormous implications for the health and well-being of the majority of Canadians and for the Canadian health care system as a whole. Taking needed care away from millions of Canadians is not the way to address fairness and equity. CDHA CEO Ondina Love speaks with radio talk show host Andrew Lawton about the #donttaxmyhealthbenefits campaign. Thank you for your interest in the Don’t Tax My Health Benefits site. On February 1, 2017, Prime Minister Justin Trudeau stated in the House of Commons that there would be no new taxes on health and dental benefits for Canadians. We thank the Prime Minister and Finance Minister Bill Morneau for this decision. We also sincerely thank the 80,000 Canadians who shared their concerns with their elected members, and all the Members of Parliament who responded.